The toggle works fine with keyboard and xbox controller, you need to merge it correctly with other mods. can anyone of you help me with installing it via Vortex? It says that the mod is enabled, but it doesn´t work. I guess I could also just find the filed in the content-directory of Witcher 3 but this doesn´t fix the problem with Vortex. Has anybody experienced that? Maybe there is something wrong with the mod directory where Vortex is saving the mods I download, but I thought it´s just like the NexusModManager, it saves the mods in a specific directory and is then modding the game. Probably a weird request but can you make one that increases the zoom while using witcher sense? I thought asking here would be right as this is the only mod I have found that tweaks the zoom, I simply do not know where to look or what to change. I'd like the Toggle, Range and sound without the effects. What can I do to achieve this result working on the "No Witcher Sense Toggle Range AIO with FX and sound" file? Used the optional [WitcherSense silent version] only since was what i was looking for, it works. But.... for some reason now my geralt dont run anymore when i hold shift while running he stops instead. Just like the stop horse in keybind option you can choose even if there isnt a option for geralt like that. Had to delete the mod until get a reply. Know how to solve this? Just in case someone else wants this how i do I thought I'd post this info. What I wanted was all FX intact, No zoom, Double range and with no toggle. I was about to ask how to do this and didn't see the answer in comments. Of course, i could've just missed it. 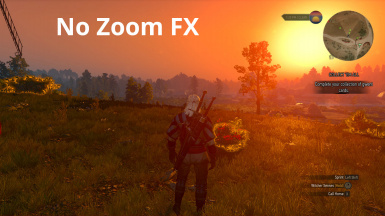 Anywho, I installed the No Witcher Sense Toggle Range AIO with FX and sound Optional file. That's exactly what I was looking for except the toggle. I just happened to figure this out on my own just before asking. It's a simple thing though. Unlike making this mod. Thank you flAked for making this and sharing it with all of us. It goes without saying but I've endorsed this now that the timer has run down and It'll be on my top mods for The Witcher 3 list. Also, Sorry if I just took up too much space with this comment. It Fix it to merge with Friendly Hud. Thank you! This fixes the conflict with auto loot also. It still zooms for me, could be mod isnt working anymore? Unsure if this mod works anymore, it still zooms, but there are no blurry edges, and it seems the range is double but unsure. I tried optional and main files, together AND seperately. I just want No Zoom, and Double-Range (and no toggle) what do I need to do for that? 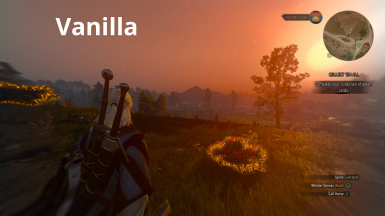 Which version specifically removes the darkening of the screen that happens while using witcher senses? I can't get this to work whether I use manual or nmm. It worked for a while (almost cleared out novigrad/velen) but suddenly stopped. Now regardless of what i do it refuses to work and I'm back to getting headaches. I've tried manually installing it. I've tried to reinstall the game. I've tried installing it through nmm. I've tried to overwrite the games focus-file with the mods focus file.